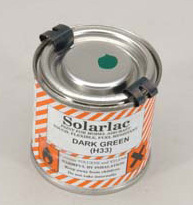 A synthetic resin paint specially developed to be used on Solarfilm & Solarspan. Fuel-resistant, flexible and glossy. Quick drying, sprays well and brushes like coloured dope. Colours match Solarfilm and can be mixed to match most other Solarfilm, Solarspan and SuperShrink Polyester colours. Solarlac is ideal for cowls, struts, engine bays, wheel parts and other parts that cannot be finished with an iron on covering. Very good on Litespan, Solartex, Fibafilm and Glosstex, car-primer, doped surfaces and clearcoated surfaces. Please note that colour samples on this page are for indication only, as colours vary according to monitor display. Please note that we are unable to send spray paints or tins, glues or solvents outside of the U.K.